Ah, April. Time for sweet blooms of tulips and lilacs, for chocolate bunnies and crinkly plastic grass; time to pay the man, Uncle Sam. Just when you most need a commiserating drink with your friends is when you can afford it the least. But cheer up: I have ten party menu ideas that'll feed a crowd for under ten bucks. 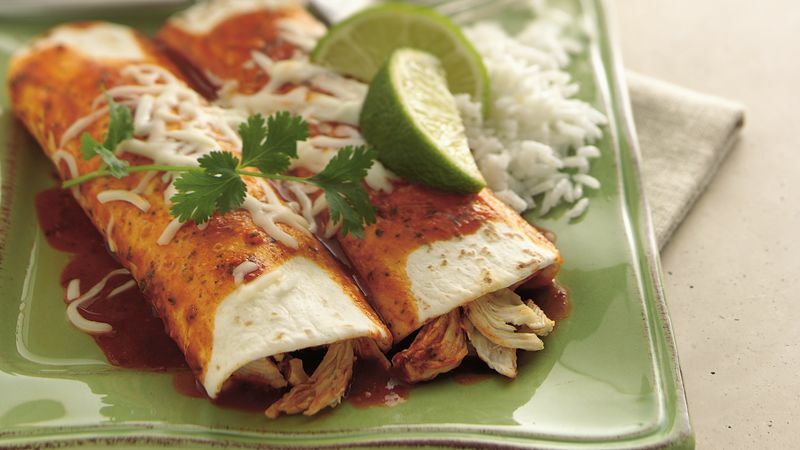 Nothing says "fiscal solvency" like a tray of bubbling-hot chicken enchiladas. Cheapskate protip: skinless, boneless thighs are more flavorful, less expensive, and shred wonderfully. Buy whole, dried chiles like anchos or chipotles (remove the seeds and stems) and grind them in a spice grinder to make chile powder better than anything you can find at the store, for mere pennies. Nine out of ten trailer park residents agree: ain't nothin' wrong with some Frito pie. Fill a casserole with Fritos and chili, then top with cheese, or go authentic and serve little lunch-size bags of Fritos with a cup of chili right in the bag. Cheapskate protip: make homemade chili instead of using canned chili (it's healthier, too). White bean puree with herbs, served with crusty bread and a drizzle of olive oil is wonderfully rustic (hint: 'rustic' is just a fancy way of saying 'cheap'). Cheapskate protip: using a pressure cooker, it only takes about 30 minutes to cook dried beans, even unsoaked. When I was a kid, one of my favorite goodies was popcorn balls. Turns out, my clever mom was turning a cheap snack into a special treat with a few cheap ingredients. Nowadays, I like to make it a little more grown-up by adding dried cranberries and a drizzle of melted chocolate. Cheapskate protip: buy bulk popcorn and pop it yourself instead of buying microwave popcorn. I love throwing brunch parties, and quiches are a great party food — they're relatively low-fuss and inexpensive. For about $3 or $4, you can get a dozen eggs, and then if you're time-strapped you can just use a store-bought pie crust. Cheapskate protip: making the crust from scratch will always save you a buck or two. This is a tested favorite of penny-pinchers. My grandma always threw one together for holidays, and I bust one out for every party. Cheapskate protip: instead of buying dressings and dips, make your own onion dip. With a pound of cheese and a few other ingredients, you can have a fondue party that rivals those of your parents' generation. Cheapskate protip: boiled baby potatoes are another cheap, filling dipper to serve alongside bread and apples. Don't waste your money at the deli! Pick up a bag of bowties or rotini, add your favorite fresh veg, and toss with a vinaigrette. Easy peasy. Cheapskate protip: blend your own delicious dressing — I love a tangy balsamic vinaigrette. Stretch a regular cookie recipe by using a tablespoon-sized ice cream scoop to portion out the dough to make mini cookies. Once I made one basic recipe for oatmeal chocolate chip cookies stretch out to 140 cookies! Okay, I added a handful of raisins and walnuts to help, but still. Cheapskate protip: get your oats and chocolate chips from the bulk bins. Pigs in a Blanket are not just for kids! Cut hot dogs in half to make them cocktail-sized, then roll them up in your favorite packaged croissant dough. Cheapskate protip: you guessed it: use homemade biscuit dough, rolled thin.